With a ratio of approximately 3:1 job vacancies for every job seeker as at November 2017, now is statistically the easiest time to find a job in Australia since 2012. Big Splash are passionate about ROI and helping our clients to understand which media is working for them. After all, that's what we do. 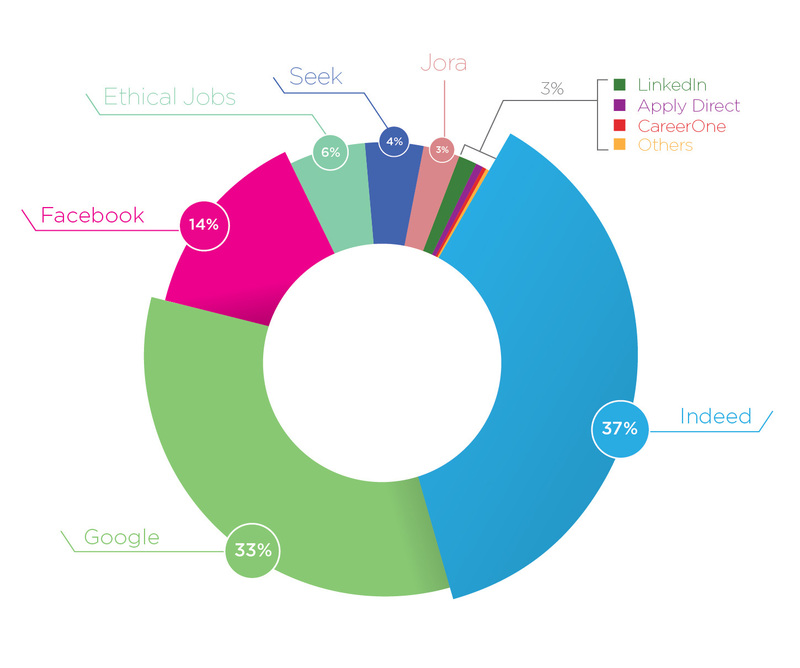 We've crunched the data from over 1 million job seeker visits to our clients' online application portals in 2017 to bring you an overview of the Australian recruitment advertising landscape. In 2017, the most significant move on our 2016 results was seen in Facebook; up from 9% to 14% as a candidate traffic source. We also saw Google (both from organic search and via our Precision Targeter packages), soar to 33% as a source of interested applicant traffic. This means that combined, nearly half of our 1 million job seeker visits came to a job application form via Facebook or Google. That's why we say that just placing an ad on a job board and waiting for applicants to flood your inbox is a risky recruitment strategy. Consider a targeted social media plan as part of your vacancy and employer branding advertising mix. A clever algorithm, combined with significant investment in SEO saw global giant Indeed continue to dominate the candidate traffic source stats in almost all industries. Indeed operates like a search engine and is continually evolving to improve the candidate experience. If you are a talented content writer and can create a great recruitment ad that’s packed with key words, more power to you. Even if you can’t, Indeed still delivers. Being a global site, it’s also easy to reach a whole world of talent via Indeed if you need it. Sometimes in the increasingly fragmented world of digital media, using a generic job board isn’t the best move for an effective job ad. Great candidates with industry experience and a clear idea of what they are looking for will seek out opportunities in less cluttered areas, and we’ve seen that with traffic to sites such as EthicalJobs.com.au surging. Don’t assume you have to advertise your opportunity in a ‘job seeking environment’. Considering the online behaviour of your ideal candidate holistically, as this will help you reach them where they live, work and play. Or if that’s all a bit overwhelming, reach out to Big Splash. We’ll be happy to help.